For any serious chef and even for the not so serious, having fresh herbs is a necessity. Dried herbs even at their freshest, have a distinctly different and, in my opinion, less appealing taste than their wet counterparts. When added to the fact that they are sold in massive quantities and will most likely not be fully used before they have completed their slow transition into sawdust, it is clearly better to have fresh herbs. The problem is that there are also a number of reasons not to buy fresh herbs: the bunches are too big, they’re expensive. One answer to this problem is to compromise, the other is to plant your own fresh herb garden. A herb garden can be a small operation consisting of a couple of coffee cans on the counter or it can be a full outdoor garden box. The size and comprehensiveness of your herb garden should be governed by two things, your cooking style and the amount of space you have. If you would just like to have a herb garden to spice up the decor of your kitchen, and maybe to add a pinch of fresh flavour here and there then a window garden is perfect for you. There are many sets that you can buy at garden centres and do it yourself stores that come with a few pots and a drainage bowl to catch excess water. Many of these come with herbs already growing in them, and simply need to be measured before you take them home and plop them in their place in the sun. The more frequent user of fresh herbs will want something a little more serious than this. To grow a herb garden that will be strong enough to survive some week long flavour binges and keep producing, you will need to get some larger pots. You will also need to decide which herbs are the right herbs to grow. In a lot of example herb gardens you will see pictures of people growing coriander, basil, and other broad- leafed lettuce style herbs. Unless you plan on growing a large amount of these, they are not really worth the time, because a single batch of pesto or a night of burritos will clean you out completely. For more compact herbs that better lend themselves to a small herb garden pick for each plant a pot consistent with the frequency with which you use that spice. Once planted, let them grow to a size at which they can sustain the amount of defoliating that you plan on doing to them. One of the main mistakes made by people who grow their own herbs is taking too many leaves before the plant is grown to an acceptable size, if you do this you will effectively just be buying living herb bunches and not really nurturing your own continual source. 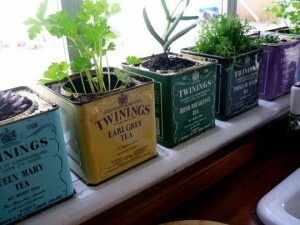 There are many options when it comes to planting the herbs, the choice of receptacle being probably the most important. 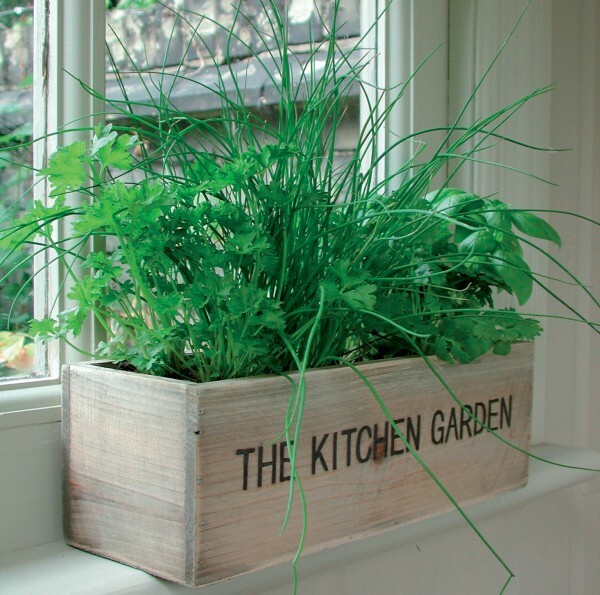 Wooden wine crates make great indoor garden boxes and you can pick them up for free from your local wine merchant. Flower pots work, but there are also pots designed specifically for growing herbs. If you want to opt out of bringing pots full of dirt into your kitchen an increasingly popular option is to grow your herbs hydroponically. Hydroponics may sound beyond the realm of a simple kitchen gardener but it’s actually quite simple and your local garden centre should be able to help you out getting started or recommend a hydroponic store that can do the same. Growing your herbs in water makes for a much cleaner kitchen and there’s only a very slight chance of being put on those government lists you hear so much about. In the end having a kitchen herb garden is very easy, you just need to work with your space and it can easily be the most rewarding garden per square inch you’ve ever had!